Endorsements- When it comes to knowing whether or not they can trust your company, a customer is really taking something of a chance. You, after all, know that your business gives the best service and that you are committed to making your client happy. Your client, on the other hand, really has to just take your word for that. In a perfect world, that would be enough. Unfortunately, most consumers out there have been burned in some way or another. Whether it is a company that didn’t deliver the service they promised or a product that was faulty. As a result, people are a lot less willing to take things on faith now. You need to be able to convince them that you really do offer that sterling service. The best way to do that is to get word of mouth recommendations from previous customers. People are more likely to trust that what you say is true if another client assures them that it is. It’s a simple fact; people place more stock on the word of mouth recommendation that they get from someone else. What is the Number One Way to Endorsements? Do it well enough, and they will become brand advocates for your company. They’ll go out and tell all their friends and neighbors about the great experience that they had. Get this right, and you have started forming a good relationship with your client – one in which they feel valued and important. Get it right, and not only will they be willing to become a brand advocate, but you can even ask them to endorse you. Isn’t it Tacky to Ask for Endorsements? It’s not the first thing that most business people think to do – some even think it is a little tacky to do so. But there is nothing tacky about it if you approach it correctly. After a pleasant interaction with a client, you can raise the topic in an offhand way. Obviously, if the person says, “No” that is the end of it, drop it, thank them once again for their business and let them get going. Nine times out of ten, however, people are going to be willing to help out. Explain how they can do so, making it as easy for them as possible. It may feel a little awkward doing this the first couple of times, but you will soon get over that awkwardness. It pays to remember that when people like the service they have received and feel valued by you, they are only too happy to do something small as a way of saying thank you for it. 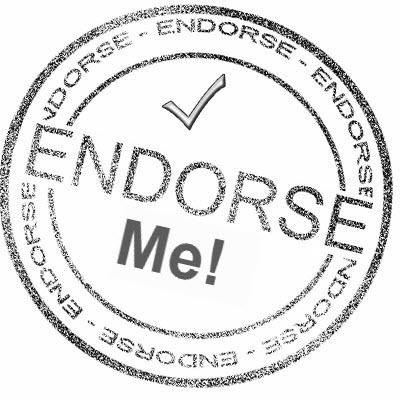 eEndorsements is a complete reputation management platform for small business.